As I review my Thanksgiving menu I've realized that our special meal is in good shape. The Grand Marnier Cranberries are prepped and chilling, my son's favorite Golden Bread Braid is par-baked and ready to be finished just before dinner is served, the Orange Streusel Sweet Potatoes are baked, mashed and resting in their serving dish just waiting for the Streusel to be added, the Cappuccino Fudge Cheesecake is cooked and looking lovely, and the turkey is dressed and roasting away. My husband is enjoying a quick light lunch with our guests and we have a couple of hours before the festivities begin. With most of the work done I have a few minutes to just sit and be thankful. And thankful I am! I'm thankful for my family all living so close, thankful that our parents are relatively healthy and able to join us every Thanksgiving. I'm thankful for our lovely friends, who we have come to consider family who are always a part of our Thanksgiving as well. They were the first people we met when we moved into our home some 13 years ago and have been special to us ever since. I'm thankful my husband flew his plane home safely and that he is not spending his Thanksgiving in a hotel like he did last year. I'm thankful for my kids who still give me hugs (but not in public!). And I'm thankful for my new blog friends who have quickly become a big part of my life. Thank you all for your wonderful support as I started writing this blog. When I began I simply had intentions of recording recipes in an organized manner, but I quickly came to understand that Liv Life is so much more than that. It's a connection to people all over the world, people I have come to look forward to touching base with several times a week, people who I don't actually know what they look like, yet I think and talk about during my day. I wish you all a wonderful, safe Thanksgiving Day! And for those in other countries, I wish you a wonderful day as well in whatever you may be doing. With many of us here in America cooking Turkey, leftovers are another thing to be thankful for! Garlicky Tortellini Soup is a perfect vehicle for some of your spare turkey, and a simple, satisfying meal to toss together when you may not really feel like cooking. Filled with ingredients that you most likely have in your pantry or freezer, this fragrant soup goes together in record time, and if you make enough, will provide its own leftovers for another day. Melt the butter in a large sauce pan over medium-high heat. Add the onion and sauté over medium low heat until just tender. Add the garlic and sauté until fragrant, about 2 minutes more. Add the broth, tomatoes and water and bring to a boil. Add the tortellini and turkey and simmer until nearly the tortellini is nearly done. Add the spinach and cook until wilted, 1-2 minutes. Stir in the prepared pesto and cook 1 minute more. 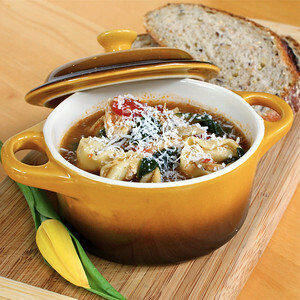 Ladle into bowls and top with grate Parmesan. Serve with a nice crusty bread to mop up the juices! This soup has been submitted to Deb from Kahakai Kitchen's Souper Sundays! Happy Thanksgiving! I hope you have a wonderful day with your family. Your menu for today sounds absolutely delicious. The soup looks sooo good and perfect for leftovers! I love love love garlic, so this soup is just calling my name. Gorgeous picture of the soup too! Happy Thanksgiving! I don't think I'll have turkey leftover 'cause I'm not the one making the turkey but there is not need for Thanksgiving leftover for this wonderful soup! And I agree with Lindsey: boy that picture....I haven't even started to eat to I'm so hungry and it's soooo enticing! That looks soooo comforting!! And anything "garlicky" gets my tick of approval, sounds yumm!! I've got a ton of leftover turkey meat just waiting to be turned into tasty leftovers, so this is PERFECT! Hope your Thanksgiving was wonderful...mine was, but I'm tired ;)! Oh, I just love this idea. I have a kielbasa tortellini soup recipe and it's a family favourite, but I bet the addition of turkey (and minus the kielbasa) and they'd still love it! I really enjoy reading you blog! I just nominated you for A Stylish Blog Award! Keep up the great work! That looks great. I love torellini, especially in soup. Hope that you had a Happy Thanksgiving with your family and friends. We'll be making a turkey carcass soup, but I'm saving this on to use with chicken. Tortellini is one of my favorites. Any excuse to have some sounds good to me! Great idea for utilizing turkey leftovers. Hope you had a great Thanksgiving! Kim - this looks so amazing and satisfying! Hope you had a wonderful Thanksgiving and congrats on the Top 9! What a perfect way to have leftovers. I love it. That is like the perfect dish for any occasion! What a wonderful and delish comforting soup. I used to make turkey vegetable soup for years, and for the last decade, have not done so, since we have so many additional dishes that are contributed by family, and friends to the table. I will certainly make this easy and yummy soup since I have nice chunks of leftover turkey. 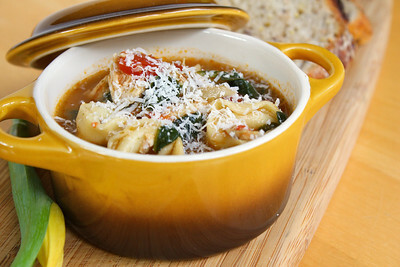 A nice warm bowl of tortellini soup with your left-over turkey, great idea. Too bad I just used the rest of my left-overs on pot pie, although that was super too. This is the perfect way to use up leftover turkey. It is gorgeous. Congrats again on the Foodbuzz Top 9 and thanks for sending it to Souper Sundays too. Just made this! It was delish, but fyi, your recipe does not list when to put in the chopped turkey! Just threw it in with the tortellini and all was well. So yummy. Alayna... thanks so much for the comment and pointing out my omission of the turkey! You did great! I'm glad you enjoyed it, my FIL actually asked for this after our Thanksgiving this year. It's his favorite soup.